Welcome to the Phoenix Game Chat League. If you're a regular visitor, please thumb this list so we know you're lurking, it's how we discover new friends. If you wandered here by accident, this link will tell you about us: Phoenix Chat League. Joel picked me up at the airport, took me to his home, and we spent that evening going through the rules of one of his favorite games. This is one I've owned for a long time & long wanted a teacher or a similarly impassioned (and patient) compatriot to sort out it's particlar complexities. This is Joel, the next morning, on the other side of the gameboard as we played it. The next day he took me to DJ's and they taught me their new favorite, Age of Steam. Here is DJ and I playing the Montreal Metro map deeper in the weekend we called CabinCon, since we'd rented a getaway cabin in the countryside along the Mississippi, away from everything, for four days of gaming. We only brought games we all wanted, passionately, to play. And we didn't take too many either. And so we played them multiple times. This week, the topics you may explore are about the particulars of feeling passion for a particular game, and if and how that passion is shared. This is the game Joel taught me, a truly unique game design that I've long wanted to experience, and I'll never forget the care and passion he invested in it's teaching. Have you been on either end of a remarkable and passionate transmission of a particular game? Tell us about it. DJ and Joel both recently joined the Age of Steam tribe, and they initiated me this past weekend first with a map and variant ruleset involving zombies, and our second game was set in Montreal. Their enthusiasm was infectious and I'm quite taken by the game system. I've long been very intrigued by it, and fully understood it's powerful pull on many, but I waited until now to get the hook set. Have you experienced a sub-genre or extended gaming system? Or do you want to? Please describe both. When have you last experienced a sequence of plays with a design and a particular table or atmosphere that was so good that it made you reconsider your top ten? Even if it did or didn't change it... Perhaps the deeper play made you re-consider or simply want to re-articulate your notion of what gaming is or should be. Please tell us about it. Gaming Notes: There was no dedicated gaming day this week, but I did manage to pick up four nice sessions here or there. Terra Mystica was the same-old same-old. I have been testing a couple of the expansion races for the Feuerland folks (though the copies I have are by now terribly out of date) and the best player in our session won handily with one of those races against a table of base-game races. As usual, I came in between 125-135, which was good enough for second, but not close to the 175 scored by Charlie. 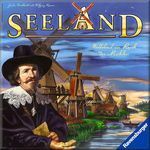 My wife and I broke out Seeland for the first time in a year and a half on Friday night. I miss the game, and I recalled why I had initially been so enamored with it. But I just don't have the table for it, and it reminded my wife why she had disliked it. Our session was actually remarkably interesting from my perspective because our scores were exceptionally close throughout the game. We were fighting hard over the final governor (we kept completing each other mills in order to ensure that the governor was not satisfied) and eventually had to remove it from the game when there were no mills left on the board. By the end of the game, I thought my wife had forced a tie when I realized that there was one spot on the board that I could score immediately with a single mill placement - 4 points for the good guys and the guaranteed win. We both had 230+ points, yet I won by a mere 4 points. We pretty much split the bonus points from governors and records. I think if this had been my first-ever session I would have worried about its viability as a two-player game given the closeness. But I have enough experience to know that it was a just a hard-fought session by two seasoned competitors. My wife and I followed up Seeland with At the Gates of Loyang. I often compare these two titles in my mind - both are primarily two-player games in our household, ones that we turn to when we don't want anything too heavy. The former is my favorite of the pair; the latter used to be hers. She got pretty frustrated this time around, however, as I regularly drafted the cards that stole things from her (not out of meanness, mind you, but because I needed things that only she had). I was pretty rusty and took a first-round loan, but it didn't seem to hurt me. I ended winning by a full a point (18 + 11 yuan to 17 + 11 yuan). I recall having a conversation on the GCL a long while ago about the viability of loans in this game. I still maintain that an early loan can do more good than harm in the right circumstances. The last game of the week was Bora Bora, which has lost a little luster after a few three-player sessions. It's just so much better with the full compliment of four, I think. Our last two three-player sessions have seen the winner with exactly 175 points both times, which seems to be a reasonable target number at that count. I went with a slightly unusual (for me) strategy of hut-building, but could not make it pay off. I came in second with 168 or so. Iowa was gorgeous. I saw a pitch black sky with more stars than I've seen for a very, very long time. And I ran along the Mississippi River (this has a weird, pleasurable meaning for me), played Nappy's Triumph on Joel's gorgeous back porch hanging over an Iowa City creek, got to read bedtime stories to DJ's wonderful daughters, and we played Pax in the sunny grass beside a duck pond. I hold deep gratitude for my hosts, DJ and Joel, for opening their beautiful homes and taking care of this straggler. We worked in a couple more games, too. Started a Space Hulk game at, what, 2am? Check. My oldest son cleaned up with sunsets and won with 55, my wife and I tied at 40, and my daughter scored 29. It had been awhile since this had been played so my boys and my wife joined me for a game. I ended up ignoring whiskey in favor of getting cards and clansmen and also a low tile strategy, which won with 53 points, while my youngest son the whiskey baron was close behind with 50. My oldest son edged out my wife 26 to her 25. Nice weather equals less games getting played. _7_ De Vulgari Eloquentia 1 New! My weekend was dominated by judging a State Championship event for Magic on Saturday, but I managed to squeeze some gaming in around it. ...when I played De Vulgari Eloquentia. This is a very unique game. It was hard to know how to play well the first time and I think it would require a bit more than the usual number of plays to really see the different elements of the game clearly with respect to each other. I converted to religion very early and pursued knowledge and that buried me in the turn order. This meant I got no vote cubes as they were taken before my turn. I had a respectable score in spite of that, mostly based on tons of manuscripts. A neat game that is hard to imagine getting its due in my gaming environment. Not much else to report, though I did continue the gf's exposure to Race for the Galaxy with five three-player games in a row. I won three of the five, but I have a big experience lead on the other two players so that is to be expected. Over the course of the plays, we added in Rebel vs Imperium and goals. I think I'll wait a bit longer before rolling out prestige, though it would even the tables quite a bit as I am still very inexperienced with the third expansion. For those who know Magic, I had an entertaining four-player EDH game in which I was playing a mono-red goblin deck led by Krenko. I got pushed down early as the most obviously aggressive deck and sat not doing much for the first several turns. I then put together a single attack step that eliminated one player. Another player saw this and took steps to hinder me, but another couple turns later I put together another silly attack step and killed him too. The final player was my gf with tough defenses in place and some 80 life. I was able to hit her for ~50 out of nowhere, but I was 2-3 turns short of being able to finish the job and she won with Test of Endurance after rebuilding her life total. _7_ Yedo x2 New to Me! Began the week playing Pathfinder Adventure Card Game: Rise of the Runelords – Base Set and ended it with Yedo. 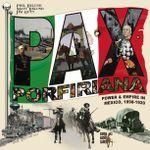 Two thematic games that I like, but am not sure I will ever love. Coincidently, both have cards with "flavour text" and my wife's attitude to both is: don't care, don't need to read them to play. I'm pretty sure she'd be just as (un)happy playing a completely abstract game as she would playing a thematic one. While theme is important to me, it's not to her. I posted my Essen List for 2013 yesterday. Thanks to everyone who has dropped in and commented. I'll be updating the list as I learn more about the games I've listed and add new games to it as well (should any catch my eye). It's shaping up to be a weird week of being on and off work. Initially S and I were going to take the week off, but sh*t came up so it looks like I'll be in the office at least a couple days. Oh, well, more holidays for next year and less time to game this week. Bruges should hopefully arrive in the next few days from Toronto. With it, the character expansion pack for Pathfinder Adventure. I can't wait to kill off a couple Pathfinder newbie characters from it. Oh, yeah, there's a Fall Canadian Math Trade happening so I'll probably throw some games on it. Bruges continues to be enjoyable. Last week saw my 13th and 14th play, both 2-player games. I won one 63-63 on a tiebreaker, and lost the 2nd 63-53. We tried out the new 6-color variant with the latest Hanabi printing. The rainbows are a full 6th color but you cannot give clues for them specifically - whenever giving a color clue, you must always point out the rainbows. We scored 24/30 and really enjoyed this variant. My wife and I are still digging this game. It's very card-driven and has too many random elements to take it very seriously. It's quite thematic and fun though. And I won 21-14. A couple more 5-player games. I was the Assassin both times and won both times. I think it's a little too easy to find Merlin with just 5 players, and we need to talk more. I did manage to talk it up and BS the table in game 2, accusing my partner of being a spy. Not enough to log it, but my wife and I played a couple of rounds of Bora Bora yesterday to get a feel for it before we got interrupted. It feels like a Feld title. My first impression is better than Macao and not as good as Bruges. I want to play it for realsies. 9/13/336 plays of 4/6/160 total games, with 0/0/29 expansions employed. Plays with 14/19/93 distinct opponents. 1/3/29 games acquired (plus 6/6/14 expansions.) - Received a copy of Sushi Go! plus several dorky expansions that I'm a bit embarrassed about. 1x _7.7_ The City - This game was totally insane. I only had son #2 as an opponent, and this game isn't designed for 2p - so he made a variant: play until there aren't enough cards to deal the new hands out. Because we prioritized VP over card income, we were making ~130VP per turn before the game ended. And finished the game with ~800VP (instead of the standard 50.) It was dorky, and he was entertained. 2x _7.7_ The City - The 5p dynamics are excellent. It's fast; relatively harmless; and the German isn't as big a problem as I'd thought when we played it for the first time. 2x _7.3_ Sushi Go! - Much better with 5 than 2 or 3. (Though it's possible that 4 really is the Best Count. But that's a number I've not yet played.) Much like The City is a distilled and simplified Race for the Galaxy, this is a really simple and straightforward drafting game that retains some real and significant decisions. It's pretty cute. 1x _7.7_ Google Datacenter Manager - The new GDM print is lovely: clear, easy-to-understand, bright. The card stock is also very impressive. It's fun to inflict it on colleagues that initially only want to play because of the Google association - and then discover the game is pretty cool, too. Outlook for the week: After two weeks of no Wednesday gaming, I've got three guys that claim they're planning to come over. I think I'll push for Princes of the Renaissance! Hopefully, there'll be Friday and children gaming, too. On Sunday the 6th, we played Mystery Rummy: Jack the Ripper twice, which I mentioned in the last list. On Friday we drove up to Syracuse, and on Saturday we had a game day with Ryan and Mrs. WriteGamer. We were all a bit tired and/or sick, so we had to scale back the length and complexity a bit. Then Ryan got out Montgolfiere, which we played three times. I really like the wooden hot air balloon tokens. This is a simultaneous turn game, which kept us all involved. I had portions of time where I was doing well, but never came out ahead in any of the games. Then I took the opportunity to play Euchre. We played two games, both of which Sam and I won. It was nice to have a game day again. I gave my dad his birthday Crokinole board, but we didn't get a chance to play. I'm looking forward to it. We got back to Middletown yesterday, and today I'm digging myself out from under my pile of subscriptions and catching up on things, and trying to get over my cold. Let me see if I can remember how to do this. I promised Tom I'd jump back on the GCL this week since we just completed CabinCon. He has some work/family obligations that will tie him up most of the week so I'll share some of the details of our long weekend of gaming. Since there will be a fair bit to post I'll just add the plays by day in the comments below. Tonight was the a night of celebration, the first anniversary of Rugby on Board with three of the four founding members in attendance and another six regulars including Hamish and Neil from our local FLGS. I'm really happy with how the group has grown while keeping a solid core group. This has a lot to do with one of our number who has not missed a single meeting and brings new people every week, and has also been supported by the founding of Rugby's very own FLGS (Shadow Games). Having not had a local game store before this has been fantastic, and they have discovered, developed and grown a community of gamers within the local area, which in UK midlands recession-ville is an impressive achievement. Stuart bought this new title along and taught to five of us. I was up for anything with a bit of meat on it, as I'm getting a bit bored of playing filler titles and while I hadn't even heard of this before it was just what I fancied. This doesn't really do anything new, it has a worker placement core which borrows mechanics from the giant's of the genre Caylus/Agricola and the ranked action tokens from Aladdin's dragons/Keydom. 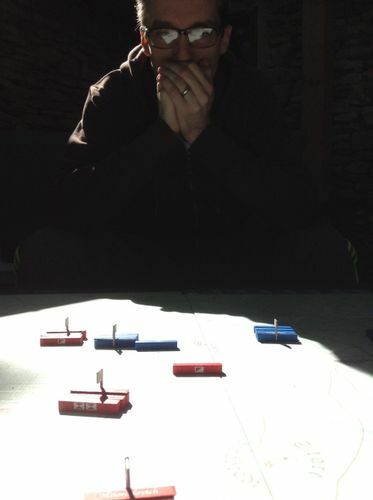 The game is split into three identical rounds(voyages) and each of these is broken into two main phases - firstly players allocate actions to the collection of resources (cannons - allow you to defeat enemy ships/forts, stores - extend the range of voyages, crew - required for taking towns/forts, trade goods - necessary for gaining goods in a set collection, the biggest available points, boat improvement - needed to battle ships, some special abilities - such as extra first action, ability to partially determine enemy strength, and to switch placed tokens). The new mechanic here is you are filling up spaces along a linear track of available actions in which the first player to place on an action space steals it entirely or is granted a significant benefit. While you have a large amount of actions you can only go forward along this track, never back, and you need to decide whether to leap ahead taking a small number of the tastiest resources or go slow and steady hoovering up what is left by others. The speed at which you progress along this track also leads to the turn order for the second phase of each round and having a higher place is crucial as it determines ties. Like all good worker placements you want to do everything but can only do so much and are limited by the actions of other players. It is easier to specialise and attempt to fulfill one or two of the three types of missions (attack enemy ships, towns, or settlements), however you want to do all three as there are big end of round bonus points on offer for accomplishing each of the three categories. You also can't neglect trading, this provides a huge single scoring opportunity at end of game. You can only do four things total (an additional action is available to one player each turn via the Golden Hind), and you may not get to do the thing you want if others are trying to do the same as you and have higher priority (having placed their lower number markers at the same location). Player order is vital as the first to succeed in each mission type is granted a 3-5 point advantage in the form of silver, gold or ruby's which are safely deposited into the players' treasure chest (an attractive, sturdy cardboard screen)for end game scoring. There is also a blunt catch-up mechanism, with player order for voyages two and three determined by reverse score similar to Power Grid. In our game I was ahead for both rounds one and two which meant I was in last place for the first phase of the subsequent turns. This hurt a lot. Trade goods however, aren't scored until end game and it appears to be a good strategy to stock up on these early on, gaining advantage in the resource collection phase while maintaining a low score on the board and then swoop in for a win in the last turn. This almost happened in our game and led to a nail-biting finish. I just managed to hold onto my early points lead by concentrating solely on trading on the last turn, gaining the three goods I needed and keeping me ahead of second place by a measly two points - the remaining players fell in some 20-30 points behind. I'll need to play again before making my mind up on this one, particularly concerning replayability. I'm unclear what different strategies might be available, and I suspect the depth of the game lies in the interactions between players during the two quasi-auctions which constitute each turn. The theme meshes well with the game play and the production values are excellent, if leading to an expensive game ~£65 rrp here. If Aladdin's dragons crossed with Powergrid sounds like your sort of thing, I'd definitely recommend trying this. One great thing going for it (for me at least) was that it lacked much of the stress I sometimes experience when playing some of the weightier economic and worker placement games without appearing to sacrifice depth or excitement. _9.5 _Krakalaken Poker. We finished off with what is quickly becoming our end of nighter. I appeared to be psychically attuned this evening, making so many correct calls that others began to stop passing me cards. In my game playing life, I've only occasionally experienced a euphoric feeling of invincibility - heightened by adrenaline, and a belief that 'nothing can go wrong' - I caught a hint of that in this game. I've heard gamblers describing the same feeling - it seems to always come before a massive loss, and reminded myself never to attempt to gamble (or play Krakalaken Poker) professionally. It was my second play of Sentinels and I didn't feel like we made many more decisions this time around. We were Ra, Tachyon and Chrono-Ranger against Omnitron and the villain destroyed us in short order. We saw lots of effects that dealt multiple damage to everyone and had no healing to speak of. The game doesn't really grab me but I might try it again to see if I can win one time. The game's owner was shocked that we lost: he was on a long winning streak before inviting us over. Pathfinder is a similar co-operative adventure which doesn't feel like it should work but somehow does. Essentially, all you're doing is flipping random encounters and trying to roll high! There's a bit of strategy around which locations you go to and some hand and deck management, but there's not a whole lot to it. Even so, it's been an enjoyable team experience and we've all found it quite addictive trying to level up our characters. I've been playing Lem the Bard, who seems quite flexible and powerful. Aside from the first game, when we didn't have any idea of how to manage the timer, we haven't really found any of the scenarios to be very challenging but maybe the expansions will remedy that. On the other hand, it'd be annoying if an experienced character dies after we've put so much effort into building up the deck. 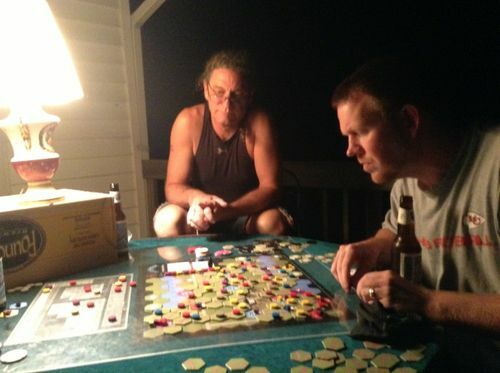 Terra Mystica was a three-player where Trading Posts were important. I was Swarmlings with the Trading Post-related favour tiles and managed what felt like a rare win with a margin of 5 points over Kate. She did well with Chaos Magicians despite almost never receiving any power from adjacent buildings. We both had a dozen or more plays over Simon, who was only on his third play. Lots of EDH/Commander games of Magic, one of which involved an embarrassing infinite combo which I won't be playing again. Then Kate thrashed me at Town Center. Still good fun, but this time I was stymied by a lack of elevators - my town had to expand outwards rather than upwards, which restricted its points-scoring potential. I continue to look forward to trying the New York and Paris expansions.